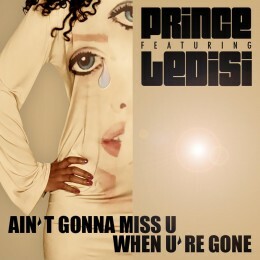 The Hornheads appear on 2 more Prince singles”Boyfriend Demo” and “Ain’t Gonna Miss U When U’re Gone” featuring Ledisi. Both are available for download at 3rd Eye Girl. (update – Boyfriend is no longer available at the 3rd Eye Girl site). “Boyfriend” has some fun interplay between 2 differently configured Hornheads passes. So 10 horns! This arrangement came together in a very different way than most Prince charts. He sent me a very simple track that had just a basic rhythm section and instructions that it was an instrumental. I created an arrangement with two 5 piece sections. One ensemble is muted brass, tenor, and alto while the other is a standard Hornheads instrumentation of 2 trumpets, bone, tenor, bari. The muted ensemble carries the hook played in unison and the 2nd ensemble fills things out more like a standard horn section. Prince took this arrangement and essentially edited out the some of the horn parts to make it work with the vocals, synth parts and other elements that he had added in. It was really fun hearing how much the final version had evolved from the way it had originally been presented to me.